Designed as a how-to guidebook for administrators, faculty, counselors, and business partners, The Career Pathways Effect brings together 27 national experts on Career Technical Education (CTE), Career Pathways, and Programs of Study. This timely publication represents a collaborative effort between the Center for Occupational Research and Development (CORD) and Advance CTE , formerly the National Association of State Directors of Career Technical Education Consortium (NASDCTEc). It offers evidence-based support for the concepts and principles associated with Career Clusters, Career Pathways, and Programs of Study and a template for more uniform implementation across the nation. The Career Pathways Effect is organized around Advance CTE ’s new vision for CTE; five guiding principles to help ensure students of all ages are prepared to succeed in education and careers that will enable the U.S. to flourish in an increasingly competitive global economy. Learn from experienced leaders as they offer guidance to states, local districts, postsecondary institutions, and business leaders on systemic improvement and innovation in the development of Career Pathways. 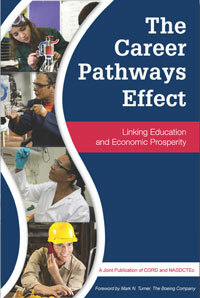 Let The Career Pathways Effect guide your journey in designing and implementing Career Pathways. Whether you prefer the feel of a book in your hand or a handy E-book, order your copies using the shopping cart below.